PRE-RACE: My goal going into Cleveland was to run a sub 4 hour marathon (9:10 pace) or record a Personal Best (PB) trying. The plan was to find the 4 hour pacer and hang with them until the 20 mile mark. This plan worked near perfect at the Shamrock Marathon just months before when I set a new PB. Running with a pace group was the perfect road block to keep me from going out to fast. I rode the 4:15 pacer at Shamrock until mile 12/13 and at mile 20, I was in the right place, coming off the right pace to make a charge for the finish line. A 36 second PB was the victory that day. up as any marathon I’ve run. Being the 36th year of the Cleveland Marathon, you would have thought that they figured out corral starting by now. There were three corral banners posted on the sides of the start chute, only 50 feet apart. These corrals appeared to be for the elites or maybe the Boston qualifiers, not for the other 90% of us. I was looking for the 4 hour pacer but could not find them in the “corrals.” I found the pacer later inter mixed with the half and marathon crowd. That’s right nearly 90% of the field started in one massive sea of colors. Mile 1 13:15 (poor GPS signal) The first mile was, a joke, and this I believe threw me off my game. With wave after wave of humanity all trying to get going I could get no closer than 50 yards behind the 4 hour pacer. After the horn went off…the pacer was lost. Although I knew better, my run was fueled by trying to find the pacer, running a bit faster then I should have. Running the right pace is the runners’ responsibility, I know that. Off my marathon taper and in what might have been the best shape of my life this part of the run felt great. 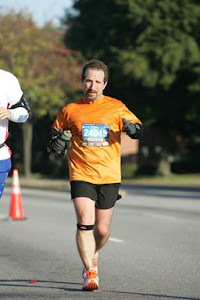 My legs had a lot of zip in them and I knew I was having a hard time running within myself and within my plan. Every time I looked at my GPS I was a head of the planned pace. The weather conditions were perfect, cool temps and a nice breeze kept my motor at the near perfect temperature and it was so easy to roll thu these miles. I have only stopped to “use a tree” during one other marathon. My marathon and long run experience is that my body is good at operating slightly dehydrated. With the oncoming heat I ensured I got in all my water stops. At mile 19.5 this extra water load may have brought on some stomach pain. I have been fighting a muscle strain or pinched nerve in my stomach/groin since early Dec. Unfortunately, running with discomfort in this area has become common. This discomfort became a little more intense with the miles leading up to 19. If I could relieve this internal pressure I believed this would help with my other stomach issue, picking out a nice spot next to a bridge I got in a little “personal moment.” After this short break, getting back to the road was a challenge. I got my wheels rolling again, but it was not long before I knew something was wrong. Mile 20 11:33 THE WHEELS CAME OFF THE BUS Not sure what happened, after pulling off the road to use the tree, I struggled mightily for the rest of the race. Sure I was tired before my pit stop…not near a collapsing point. But that is just about what I did. For the next 6.2 miles…I was in pain, my stomach hurt, my hips hurt and my pride was destroyed. How could I go from a sub 4 hour goal to a near DNF status? I was so upset with myself…so angry, and so disappointed. The only thing I could do was to put my head down and move forward as fast as I could. And that is what I did. Mile 26 7:41 Seeing the mile 25 marker and knowing that only 1.2 miles stood between me and the finish, gave me a lift in spirit allowing me to get back up on my stride and motor home. The final turn for home includes a nice downhill and left turn towards Cleveland Browns Stadium. The extra kick in my pride helped push me forward and all the pain and discomfort left me. POST- RACE: We stuck around to see a friend, Tony M. finish his first marathon. Cheering the runners along after I caught my breath and came back to life was a lot of fun. Witnessing parents finishing carrying their young children, and school kids finishing the final mile of a 26 mile school run challenge, reminded me we all run for different reasons. Only thing keeping me from jumping off marathoner bridge is the realization that; previous to Cleveland my blow up marathon time were 4:43 – 4:55 and my 10th marathon blow up time was 4:24:43 = progress, I’ll take it and move forward, because that is all I can do. Congrats on #10, I know it wasn't the race you planned but like you pointed out, look how far you have come. Your "blow up time" (which is still great!) is 20-30 minutes faster than previous "blow up times", that just says how far you have come and much stronger you are. Look at the victories, you ran another marathon, you are stronger for it and pushed through, those are bigger victories than any time ever will be.